Directions: Warm 1/2 cup olive oil in a small pan. Add 2 tbs. ground cloves. Heat for 20 minutes on med heat. Remove from heat, let sit overnight then strain into a small glass jar or bottle. To Use: Rub into your scalp and comb through to the the ends of your hair. Wrap in a shower cap and leave on for 20 minutes. Before rinsing, apply shampoo and emulsify. rinse then shampoo again. This homemade hair dye rinse will add shine and depth to your natural brown hair color. If applied to blonde hair, you'll get a slight darkening effect. Directions: Brew coffee or tea. Allow to cool. Saturate hair. Let set or 15 min. Then apply again. Rinse well. Directions: Add ingredients to a non-metal bowl or pot. Use a double broiler for this. Simmer ingredients in water 20 minutes. 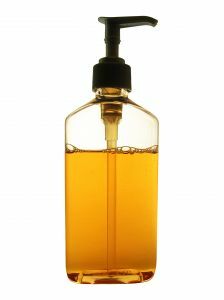 Remove from heat, strain ingredients, saving liquid in an old shampoo bottle. Apply to hair as a final rinse. If you're looking to skip all the chemicals that are in regular brown hair dye, try making your own natural hair color. It's actual quite simple with the right herbs. Although don't expect salon results. Homemade hair dye is more like a color rinse that will add natural highlights and tones to brown hair and is more likely to blend grey hair then to cover it up. You can also add beautiful red tones to your brown hair with a hair dye rinse. Learn how to make a simple hair color rinse. Directions: Prepare a strong tea from black tea leaves and cherry bark. The longer you steep, the stronger the rinse. Use as a rinse after shampooing, finishing with a water rinse. For more information on which herbs you can use to color your brown hair naturally, see Which Herbs make natural brown hair dye rinses. Certain roots, herbs and powders can add red highlights to brown hair, darken or add shine to your hair color. 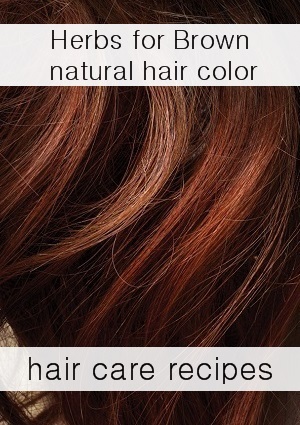 To add red highlights and tones to brown hair check out how to make natural red hair dye page.